The stalled Libyan Political Agreement is not set in stone, UNSMIL chief Martin Kobler told the United Nations Security Council today. Describing the LPA as a framework which even its most vociferous critics acknowledged was the only workable option, Kobler admitted it had not fulfilled expectations. “The implementation has stalled,” he said but added “However, its articles are not set in stone. The Libyan Political Agreement even foresees a mechanism for change, should the political circumstances demand”. As the 17 December first anniversary of the Skirhat signing of the LPA approaches, the Outgoing UN Secretary-General Ban Ki-moon warned that the window of opportunity for the agreement had created was closing rapidly. Ban urged all Libyan actors to pursue national reconciliation in earnest. 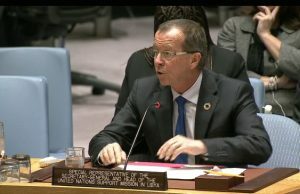 Kobler told Security Council members that though the trebling of oil output to 600,000 barrels a day had brought some economic relief, Libya was still running a budget deficit of 70 percent of Gross Domestic Product, one of the world’s highest. Moreover, he said that the problem for the PC was being able to use increased oil proceeds. “The relations between the Central Bank and the Presidency Council are strained” said Kobler, “While some opponents of the Libyan Political Agreement in Tripoli seem to have unrestricted access to huge sums of money, the Presidency Council and the Central Bank of Libya are still struggling to find a way to disburse money”. Warning that the country would face an economic meltdown unless there were changes, Kobler pressed the Central Bank the save the Serraj government and other institutions “by rapidly disbursing money in an orderly way but with a minimum of bureaucratic procedures”. He warned that financial reserves, which had stood at $109 billion just three years ago, were now close to $45 billion and falling. Kobler praised advances against terrorism in both East and West instancing the victory in Sirte. “Although they continue to be a threat, the days of the Islamic State controlling territory in Libya are over, while in Benghazi, the Libyan National Army continues to make progress taking area after area”. Kobler added: “I would like to pay tribute today once again to all the sons of Libya who have sacrificed their lives for this common cause. And I would also like to commemorate the many civilians who died in the course of these clashes”. The UNSMIL chief continued to press for the House of Representatives to amend the Constitutional Declaration to include the article of the Libyan Political Agreement. He also urged security improvements, saying Tripoli militias had to be tackled urgently. “In this regard” he said, “I give my full backing to the creation of the Presidential Guard, which will provide protection to state institutions and embassies. I agree with those who say the Presidency Council and the Government of National Accord must not be protected by armed groups”. Kobler explained that he had visited Tripoli migrant camps and found the conditions for detainees completely unacceptable. To its shame, Libya had become a “human market place … This has to be addressed, this has to end” he said. Kobler also said that UNSMIL needed to be back in Tripoli where it could be far more effective than in its current Tunis base. He later told journalists that new Tripoli premises had been located but did not say where. The organisation would return to Tripoli in phases once security had been assured, he said.